I'm back from the land of make believe. Time to catch up. I'll have a summary post of my travels very soon. I want to go to there and there. Drilling and filling cavities might soon be a thing of the past. Melinda Moyer offers a sensible examination of the science around "carbs bad, fat good" and "fat bad, carbs fine". Here is a nice bit of push back against the extremes of over-scheduling, over-planning, and over-perfecting our children s' summers. 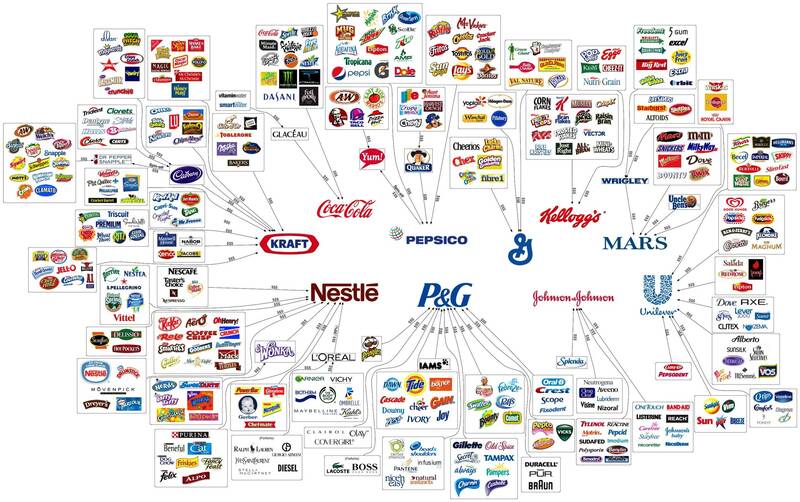 Ten general consumer-oriented firms have tremendous reach because of their vast brand empires as summarized in this graphic. I love this post by Steve Landsburg because it captures an important point I try to make often. It is a point lost on many people, and in making it I get (unfairly in my opinion) the reaction from others that I am confrontational, judgmental, and snobby. You can like red while I like blue. Those are opinions. There is no right or wrong without further context. But if you tell me you like red and then always choose blue, my telling you that your behavior seems inconsistent is a good observation--not a bigoted one. Further, telling me that red is the better color to paint the ocean in a picture may not stand up to scrutiny, and we may have left the realm of equal-value opinion with this added context. Further still, opinions that have no right or wrong cannot have any arguments to support or defend them. The existence of any logical argument for or against an opinion means there must be to some extent or another right and wrong (illogical) opinions in a particular case. In short, the interjection of "it's a matter of opinion" is in many cases a cop out. And "agree to disagree" is often the argument of the weak/lazy minded with a touch of condescension.